How do firefighters put out a blaze when they can't reach the flames? That's the challengefirefighters confronted in 2008, when a B-2 Stealth Bomber crashed on the runway at an American airbase in Guam. The crew successfully ejected, but the hugely expensive aircraft was completely destroyed by a fire that burned deep within its wreckage. "The firefighters had difficulty getting through the composite layers of the aircraft skin to fight the fire," U.S. Air Force Chief Master Sgt. Scott Knupp told CNNMoney. The loss of the aircraft prompted the Air Force to search for a solution. "We were looking for some type of technology out there that would help us penetrate through [to] hard-to-reach spaces to get water onto the fire," said Knupp. 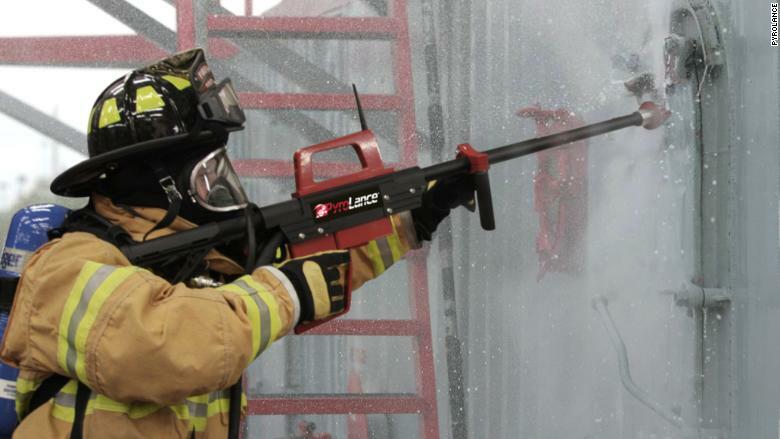 Air Force firefighters now use a system called PyroLance — a firefighting "gun" that can blast through steel, brick or concrete walls, and even bullet-resistant glass. The PyroLance uses ultra-high pressure technology. The hand-held device uses a mixture of pressurized water and granite material to pierce a six millimeter-wide hole throughobstacles. Once the ultra-high pressure spray penetrates the surface, the PyroLance nozzle continues to pump a fine mist of micro droplets into the enclosed space, lowering the temperature from around 1,500 F to 200 F in less than a minute. Using ultra-high pressure (UHP) technology to put out fires isn't new in itself. The Air Force Research Laboratory at Tyndall Air Force Base in Florida began researching and testing UHP in the mid 2000s. It found that water pumped at higher pressuresproduces millions of micro water droplets. This spray extends across a greater surface area, helping extinguish fires faster while using less water. But PyroLance president Scott Alexander said his company is the only one that uses the technology to penetrate a barrier and extinguish a fire. PyroLance began supplying the U.S. Air Force five years ago and the technology has also been adopted by the U.S. Navy, as well as numerous airports and fire services around the world. The system costs from $15,000 to $80,000, and the company hopes to sell 350 units at home and abroad over the next year. Alexander said that one of the biggest challenges his company faces is convincing firefighters that it isn't trying to eliminate their jobs or "take the fun out of firefighting." He said the company wants to reduce firefighters' exposure to intense heat,deadly backdrafts and toxic smoke environments. "The reality is we're trying to keep them safe,"he said. Instagram DOWN: Why is Instagram down? When will it be working again? Entertainment Christopher Walken (Photo: YouTube Screenshot) 10:34 AM 03/31/2018 Pinterest .. Written by CNN Staff This story is part of "Smart Creativity," a series exploring the intersection ..